Would you stop riding your bike if you were hit by a car? Not if you’re Frank Mansbach. Six years ago, a motorist struck Frank while he was on a morning bike ride. That crash transformed Frank into a powerful advocate for bicyclists in Greenville, South Carolina. Today, Frank is the executive director of Bike Walk Greenville. We recently published a city page on Greenville, and that gave us the chance to catch up with Frank, a former client of Bike Law. Frank filled us in on biking developments in Greenville. He also reflected on the 2010 event that convinced him to step up for the walkers and bikers in his community. As we head into the holiday season, we are thankful for people like Frank Mansbach, and we are proud to share his story. Frank says he started riding a road bike “in my old age,” or about 10 years ago, when he was 57. He purchased a carbon Specialized Roubaix in February 2010. The day after he picked up the bike, Frank met a friend for an early morning ride on a route used by a local bike shop. The next thing Frank remembers was being thrown to the ground as the pick-up driver crashed into him. Frank hit the ground hard and wound up with a separated shoulder that would require surgery. He also had a punctured lung that wasn’t diagnosed until he went to see his family doctor after his emergency room visit. His medical bills would eventually total $70,000. 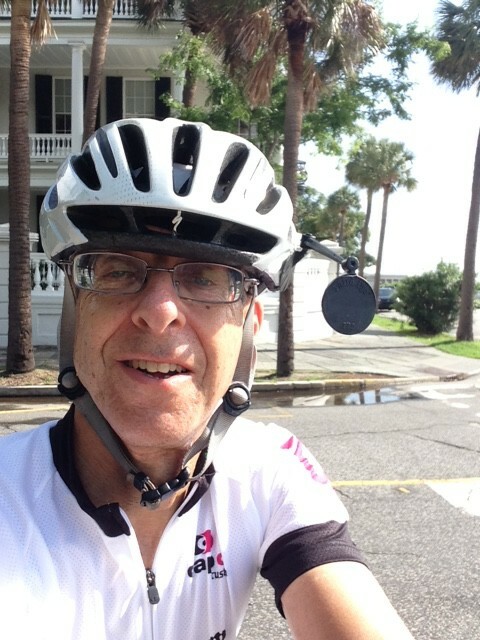 Frank searched for a bicycle accident attorney and hired Bike Law’s Peter Wilborn to represent him. Liability for the collision appeared to be clear. The driver admitted he didn’t see Frank and said he’d been distracted by something in his truck. The driver was represented by Allstate, and the insurer did not want to settle. A lawsuit had to be filed to move the claim forward. “Just before the end of the year, in 2010, as Peter had predicted, the case settled,” Frank says. Frank’s 2010 crash did not stop him from riding. In fact, he rides as much now as he ever did and has logged about 4,000 miles in 2015. However, the collision changed some of Frank’s riding behavior. For instance, he stopped taking part in group rides. He has also started riding on more low traffic roads and on Greenville’s greenways. Frank says he started thinking about bike advocacy as he recovered from his injuries in a hospital room. Frank helped set up Bike Walk Greenville as a nonprofit in 2013. In one of the group’s first order of business, he and other members worked on a road sales tax referendum that would have helped with funding for bicycle projects. Today, Bike Walk Greenville is a powerful voice for active transportation in Greenville County. A recent accomplishment includes an award winning video to promote Greenville’s “Safe Routes to School” program. Bike Walk Greenville is trying to do something about that, Frank says. Thanks again to Frank and every advocate like him for making our communities a better place to ride, walk and live.